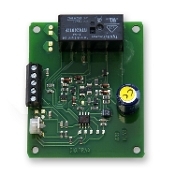 8 amp peak, 6 amp continuous Auto-reversing control for a single reversing district. AR1 operates with or without LocoNet, so it is compatible with all DCC systems. 1. Use a double pole, double throw switch to manually allow for reversing. 2. Use one Digitrax booster set for automatic reversing and another set for normal operation. 3. Use a PM42 Quad Power Manager to handle 4 power sub-districts. You can set these up to be automatic reversing or power managers to prevent short circuits from shutting down your layout.